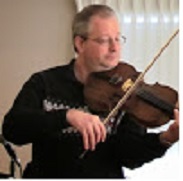 Jordan Grigg is a conductor, composer, arranger, violinist, violist, pianist and teacher. He started playing music at the age of 2 and has loved music ever since. He has played viola with the National Youth Orchestra and conducted various orchestras. He studied with Walter Trampler at the New England Conservatory. He receives commissions on a regular basis for arrangements and original works of all kinds from Italy, New Mexico, Australia and Mexico. His works have been performed worldwide. As a teacher he founded his own studio in 1992 which consists of more than 40 students in various disciplines. By now, his repertoire as a composer totals more than 1200 works, including 32 symphonies and 32 string quartets.